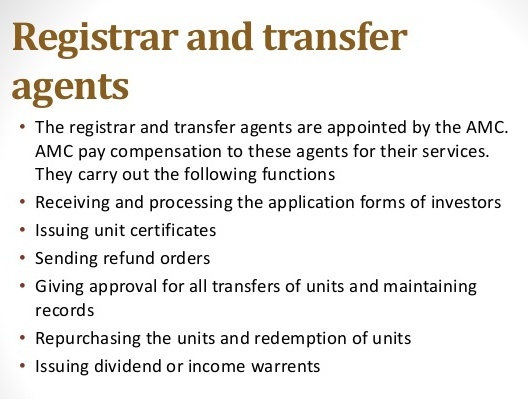 Home > Mutual Fund Investors > Mutual fund Investments : What is the role of RTAs - Registrar and Transfer Agent? Mutual fund Investments : What is the role of RTAs - Registrar and Transfer Agent? Registrar and Transfer Agent (RTAs) are the one who handle transactions on behalf of mutual funds. There are 4 RTAs in India. Most mutual funds are served by CAMS & KARVY. Sametime Templeton RTA serves Franklin Templeton Mutual Fund and Sundaram RTA serves Sundaram Mutual Fund. Both Karvy & CAMS offer online investment through their website and Apps. In case you are not tech savvy you can just walk-in any of the RTAs service center and submit the offline physical investment forms.